Seafront villa within smart complex of four. Direct access to the sea, private beach, swimming pool and great views. Ideal for those who opt for finesse & affordable luxury during their holiday! One of four villas, fantastically located within smart seafront complex. Direct access to the sea, private beach, swimming pool and great views. Luxury beach villa with direct access to the sea & Skala beach. Features private pool & fantastic Mediterranean views, located in a great neighbourhood within a small complex, 30 mins from airport. Driftwood Villa is the perfect retreat for couples. Built by wood and stone is a unique combination of privacy, comfort, art and eco-living. Stunning views to the sea and mountains. Villa with fantastic views, located within complex of four smart seafront properties. Direct access to the sea, private beach, and pool. Villa Quarda is the height of luxury style villas, built above a secluded cove from Avithos beach in the quaint countryside village of Svoronata. Within a smart complex of three seafront villas, this self-catered 3 bedroom property has a private pool, landscaped garden and direct access to the sea, located just 2km from Skala beach and village. Villa Melissa is located in Katelios, Kefalonia. Villa Peach is located in Katelios, Kefalonia. Villa Alexandra is located in Katelios, Kefalonia. Villa Marina is located in Minies Argostoli, Kefalonia. 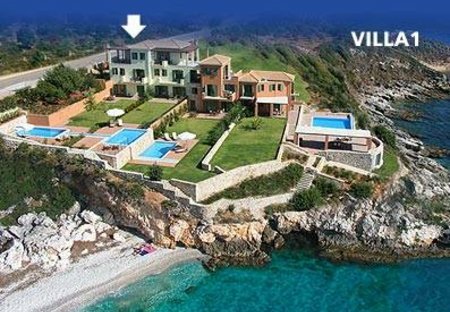 Villa Vali is located in Trapezaki, Kefalonia. Villa Cherry is located in Katelios, Kefalonia. Antigoni Beach House is located in Vrahinari Beach, Kefalonia. Beautifully decorated, exclusive villa, overlooking to bright blue Ionian sea and small island Zeus (named after the Greek God) which is occupied by a solitary chapel. Fantastic priva garden and pool. Villa Fedra is located in Katelios, Kefalonia. This vacation rental property is air-conditioned and sleeps up to 5 people with 2 bedrooms, 3 bathrooms along with private swimming pool. Maria Beach House is located in Vrahinari Beach, Kefalonia. Villa Apollo is located in Skala, Kefalonia. Nafsika Beach House is located in Vrahinari Beach, Kefalonia.